With OTT as the most actively growing broadcasting distribution channel and new services popping up every day, video streaming and television will experience an incredible and disruptive change. Companies must adapt to the behavior and expectations of their target group. This adaption includes not only Full HD or even Ultra HD content on demand, accessible from any device, but also a TV-like experience for linear content. Especially Gaming and Sports are predicted to be the highest consumer demand within the next years with substantial growth rates. In this article, we provide 4 Reasons Why P2P CDN Will Boom In 2019. Share Now On Your Social Network! With OTT as the most actively growing broadcasting distribution channel and new services popping up every day, video streaming and television will experience an incredible and disruptive change. Companies must adapt to the behavior and expectations of their target group. This adaption includes not only Full HD or even Ultra HD content on demand, accessible from any device, but also a TV-like experience for linear content. Especially Gaming and Sports are predicted to be the highest consumer demand within the next years with substantial growth rates. To hold up with the tremendous growth in demand, OVPs have to think about new strategies to scale up their infrastructure and provide the best-in-class quality of experience to their subscribers. Even a slight disadvantage in the users’ streaming experience can lead to massive revenue losses and user losses from dissatisfied customers who then switch to another (more powerful) content provider. One strategy to prevent this is to use a Peer-to-Peer content delivery network (P2P CDN) for scalability, cost reduction, and quality improvement. Traditional CDNs can usually only improve the infrastructure owned by them and count on ISPs to also expand their network strongly enough. However, this is a bold assumption. While you can use multiple CDNs to gain as much power as possible within the network, last mile delivery will always be a matter of the ISP’s capacity and available bandwidth. Peer-To-Peer CDNs can help to reduce the potential impact of this uncontrollable bottleneck from the equation of a content provider’s linear infrastructure. In this article, we present 4 reasons why Peer-To-Peer CDNs will become of much more importance than last years. The arguments we make reflect both our experiences with customers and industry partners and current trends and movements within the broadcasting industry to explain why P2P CDNs will have a massive impact on how broadcasters will deliver live video content to a broad audience in the future. A few years ago, multi-CDN solutions were not yet suitable for the mass market, but this has changed in recent years. Modern CDN switchers can select from a variety of CDNs for each viewer and dynamically determine the best route through the network based on end-device information. These technologies are currently causing a paradigm shift in the broadcasting industry. Nowadays, it goes without saying that every major broadcaster has to build (or will within the next 3 years) on a multi-CDN infrastructure. Like client-side CDN switchers, a P2P CDN also uses end-device information to determine the best ratio of content consumption from a CDN’s edge servers and other end-devices providing the same content. The idea of using end-devices to optimize content delivery was quite unpopular for some time until Peer-To-Peer CDNs were no longer the only providers suggesting this method. Multi-CDN solutions require the same approach. This opens the door to concepts such as a P2P CDN, which can now simply be seen as part of a multi-CDN strategy. While a multi-CDN strategy has the goal to always choose the best CDN provider based on custom business rules and a single user’s network information, Peer-To-Peer CDNs can help to achieve the same goal within the last mile. WebRTC was first published in 2011. However, the technology was still far from ready for a large-scale production environment. It was not until 2014 that the leading web browsers were able to communicate correctly with each other for the first time. But even at this point, the technology was still susceptible to errors and problems with the usable bandwidth between end devices. In addition, some connections collapsed, causing the entire browser to crash. This was not significantly improved until the end of 2015. At this time, the first programming libraries were also reliable for use in production. Later, native secondary implementations of WebRTC for other languages, such as Python and Golang, also followed. In 2017, Google released Meet, an HD-focused version of Google Hangouts, which was based on WebRTC from the very beginning. Today, WebRTC is a very stable and reliable communication platform that is supported and actively developed by all leading browser manufacturers. Providers like Limelight, Nanocosmos and Wowza already use WebRTC as a base technology for ultra low latency streaming. One could say it’s the perfect time to finally use this incredibly powerful technology to solve a lot of the current problems within the industry once and for all. With a current evaluation of 51 Bn. USD in total market value, the OTT industry continues to grow to an astonishing amount of 87 Bn. USD in 2023 with a yearly growth rate of 14%. This growth, of course, is directly connected to the amount of OTT platform subscribers. With the world record of concurrent viewers during an OTT live stream being broken 4 times within 2018, the strong growth of OTT as the future’s leading video distribution channel cannot be denied. With Akamai and Hotstar reaching over 5 million concurrent users and 7.7 million concurrent viewers during the World Cup, the significance of OTT becomes even more clear. This growth in subscriber numbers and demand for OTT content also means a huge increase in network requirements. Stuttering streams, low resolutions and high latency are almost certain reasons for users to switch providers or blow off some steam on social media. Traditionally, providing sufficient content delivery infrastructure was already expensive – but not depending on the number of viewers. With OTT, this changes. Content providers now pay for each viewer (unicast). With other industry trends like 360-degree video, 4K, and even 8K, there are major obstacles to be taken when it comes to cost-efficiency. Applying a P2P content delivery network gets broadcasters much closer to the old, more appreciated situation of non-scaling delivery cost. In other words, Peer-To-Peer brings Multicast to OTT. The end-device networks can take care of up to 90% of a broadcaster’s traffic while charging for the number of subscribers instead of the amount of traffic. At the same time, providing multiple data sources per device instead of an edge can also help increasing video quality (just like multi-CDN). There is one idea of how to solve the latency problem of OTT streaming by using a standard called CMAF. Bitmovin did a great job by explaining in very good detail how this streaming format works and why it has important advantages. In a nutshell, what CMAF does is splitting video segments (for example a ts file when using HLS) into smaller parts, called chunks. These chunks can be streamed almost instantaneously to a device even before the actual segment is finished by the encoding software. The implication of this process is less latency on the encoder’s end. At the other end in an OTT delivery infrastructure, a P2P CDN works the same way! Peers exchange video data among them. But instead of sharing full video segments (that would cause too much uplink overload), only small chunks of a video segment are shared by a single peer. From a bird’s perspective, CMAF and P2P technology are working towards the same goal from different starting points within the OTT ecosystem. Peer-To-Peer delivery still has to make its way into the industry. While more and more companies get interested in the general idea, there are also other trends within the industry, moving towards the same ideas and concepts. At Strive, we thought that P2P Streaming is one of the most efficient ways to deliver live video content since the beginning. We are very excited to see what 2019 will bring and how the world’s largest OTT providers will face the hard challenges that come with the non-stop growth in demand and audience size. 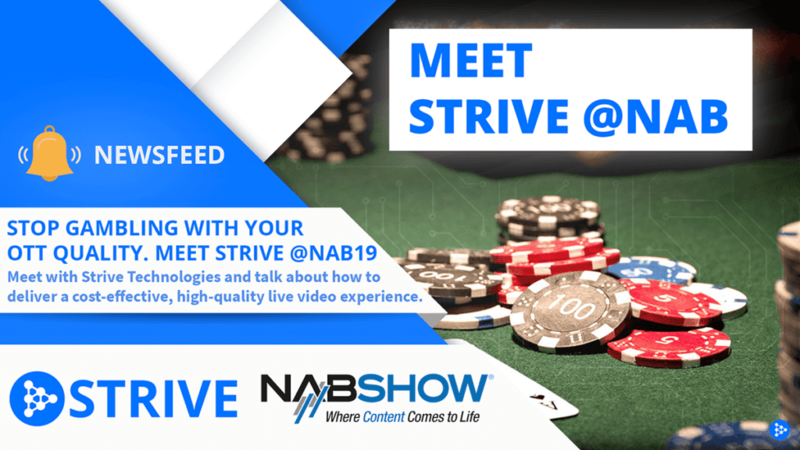 Strive is a leading technology provider for OTT broadcasters and live streaming companies. Our technology “Flink” is used by broadcasting companies around the world to improve video QoE and cost efficiency. Based in Germany, Strive developed Flink over a seven year period of time, constantly improving and adapting the technology to the quickly shifting market requirements. Today, Flink connects over 150,000 users worldwide on a daily basis, saving our customers over 80% of CDN traffic with our unique server-side-managed Peer-To-Peer network. Read about our latest stories, news and updates! We publish new content every week so make sure to get notified about interesting information on WebRTC, OTT broadcasting and next-generation video delivery technology! Read about our latest stories, news and updates! Strive – A company based in Düsseldorf, Germany. With our newsletter, you never miss any important information about our products, special offers and company news! Please enter your name, email and a date. We will contact you within 24 hours! Yes, keep me updates about latest news! I am not interested in updates via email. Strive’s core technology “Flink” is available in three variations, depending on your specific use case. Flink can be applied for both linear OTT TV broadcasting and corporate enterprise streaming. Our strong partnerships and streaming expertise form our all-round service Flink 360.